Special chocolate brownies to make everyone happy during holidays. Christmas is very near and it's time to think which dessert prepare for a special evening with family or friends. Cooking spray ;1 batch brownie batter; 1 c.(2 sticks) butter, softened; 1 1/2 c. powdered sugar; 1/2 tsp. peppermint extract; 1 1/2 c. white chocolate chips, melted and cooled slightly; Pinch kosher salt; 1/2 c. crushed candy canes. 1) Cover a baking pan (9×13) with parchment paper and grease with cooking spray. 2) Pour the chocolate batter into prepared pan. 3) Bake at 350°F (175°) until a toothpick inserted into the middle of a the brownies comes out with only a few moist crumbs, about 25 to 30 minutes. Then let cool completely. 4) Using a mixer combine together (in a large bowl) butter, sugar, and peppermint extract until light and airy. 5) Melt the white chocolate and mix salt and beat until smooth. 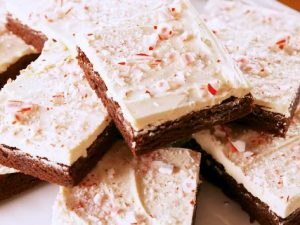 6) Pour and spread frosting over cooled brownies and sprinkle with crushed candy canes.